Bhutan, a Buddhist Kingdom of Himalayas. The country came to be known as Druk Yul or The Land of the Drukpas sometime in the 17th century. The name refers to the Drukpa sect of Buddhism that has been the dominant religion in the region since that period. Bhutan is a wonderful country which offers tourists an opportunity to experience a pristine and unspoilt holiday destination. The absence of neon lights, billboard advertising, takeaway food chains, traffic lights, etc is refreshing. The Capital of Bhutan . Thimpu Offers the best opportunity to briefly break away the tour itinerary and spend a time as of much. Thimphu is a bustling town in the banks of the Thimphu Chhu and set gloriously in the hills of the Thimphu valley. It is home to the Bhutanese Royal Family, the Royal Government and to several foreign missions and development projects. 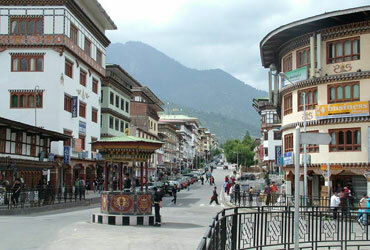 Thimphu has a population of approximately 100,000 people. Paro is a historic town with many sacred sites and historical buildings scattered through the area. In addition, the Paro Valley is wide and verdant and is recognized a one of the most beautiful in all Bhutan. The country’s first international airport is located in Paro. Due to the close proximity of the airport and the many historical and religious sites in the region there are a large number of luxurious, high-end tourist resorts in Paro. 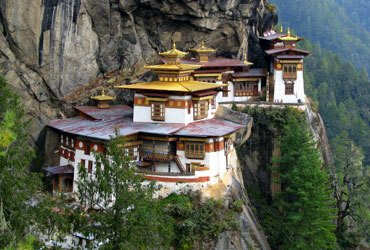 Taktshang Goemba or Tiger’s nest Monestery was blessed & sanctified as one of the Bhutan ‘s ,ost sacred religious sites. Legend has it that Guru Rinpoche flew to this site on a tigress back to subdue a local Demon. Thereafter , He meditated for three monrths. You have to register with the security at the entrance & deposit your bags & cameras. (Camera and photography is not allowed inside the monastery. Phuentsholing is the point of entry / exit for travelers and also the important link to visit West Bengal, Sikkim & Assam arriving by Road. Here all the permit / document related procedure take place to enter Bhutan.